Andrew began getting OT (occupational therapy) services this year and it has made such a big difference for him. I would sit in the waiting room and listen to the laughter coming from the kids and the therapists – what a fun job!! One day they had me come back and Andrew was creeping and crawling through this stretchy tunnel and when he would get to the end he would come out with this huge smile on his face. I love anything that gets him creeping and crawling and when I saw that smile, I knew I had to have one of those at home! Professionally Made Sensory Tunnels Cost What?!?!?!?! I did what most parents like me do when they see smiles like that, I got on my computer and searched to see if I could find one. I found some sold at stores specializing in sensory tools and toys but was shocked to see how much they cost! 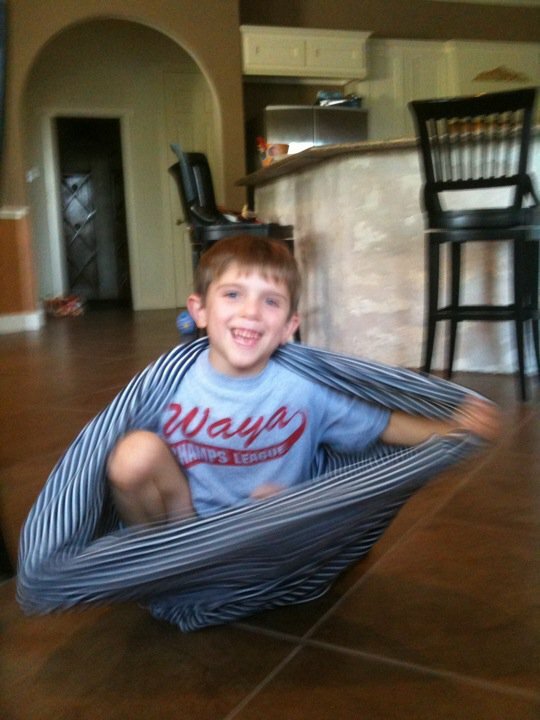 So, the next time I brought him to OT, I looked closely at the tunnels that they had, saw how basic they were and knew I could make one at home on my sewing machine. I went to the fabric store, bought 3 or 4 yards of some stretchy, jersey-like fabric that was on the clearance table (didn’t matter to me the pattern or color) and some heavy duty thread. I am not a perfectionist by any means so when I got home and began to work, I decided to use clothespins instead of pinning the entire piece (If you are a perfectionist and need to pin it carefully, by all means go for it! I just know that I don’t have the time or patience and realized that it wasn’t going to matter to either of us if the hem was a little crooked.). The tunnel is not perfect but it works perfectly!! 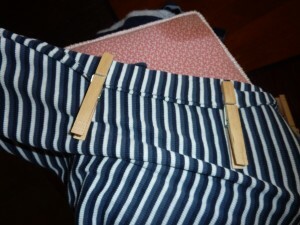 Close up of the stretchy fabric with clothespins holding the two long ends together. Pinned and ready to sew!! 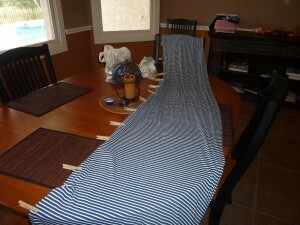 My sensory tunnel with clothespins showing open ends on each side so the child can crawl through. 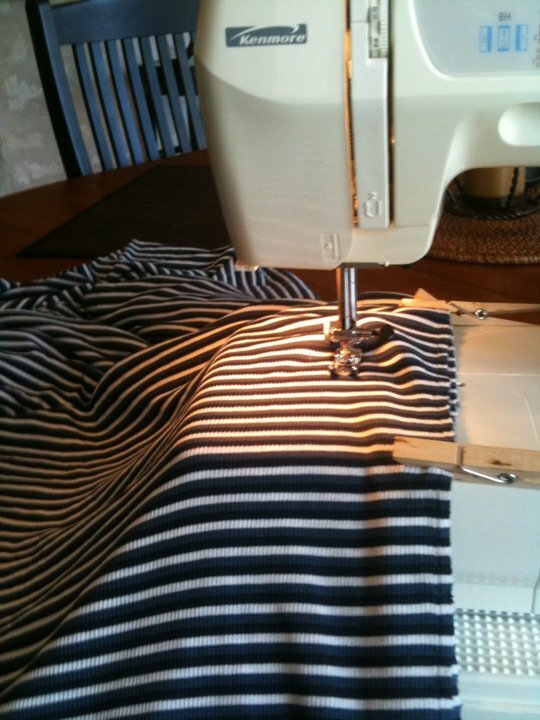 Sewing the hem for my sensory tunnel. I sewed a hem about 2 inches in to create a long tube. I did go back and sew over my hem to make sure it would hold tight. 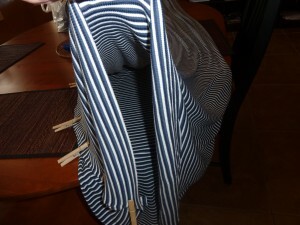 Once that was done, I turned it inside out so that the hem was on the inside. Getting ready to creep and crawl through. Andrew getting in and modeling the stretchiness of the tunnel. he LOVED it!! His very own tunnel at home. 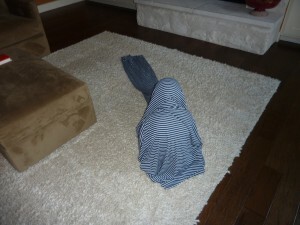 I have plans to make another one a little bit tighter to provide even more sensory input as he is crawling through. The one we have now has enough room for him to do somersaults in – huge bonus for him!! 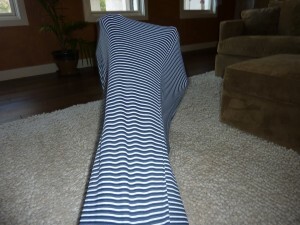 We have also used this like those stretchy body socks, positioning it so he is standing on it with enough tunnel to sit on top of his head while his arms can push against the sides.